Spring has sprung, and while many fine folk are out in their yards cleaning up from the long winter, us Grogs continue in our quest to find games to entertain us. Luckily we here at GARPA are sometimes happy to do the leg work for you. I mean come on, what more could you want … on second thought please don’t answer that question because whatever it is you’ll have to take care of it yourself. And get us a sandwich while you’re up. On to the games! 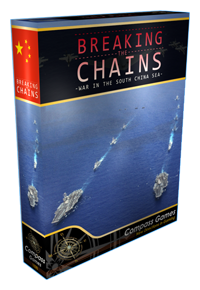 Now available for pre-order is Compass Games’ future military conflict simulation centered on the South and East China Seas. Set in the year 2021 the game’s premise has China finally making good on threats to use force to take control of “the First Island Chain - that string of islands which runs from the Ryukus south through Taiwan, the Philippines and then curls back to the mainland via Malaysia.” Since the Cold War, China has claimed sovereignty of these islands much to the chagrin of several Southeast Asian countries and many western powers. Now, Breaking the Chains brings you a detailed look at this possible conflict. The game begins with China attacking a Southeast Asian country but what countries get involved beyond the initial conflict is all a consequence of decisions made by the players over the course of the game. Players take turns moving air, ground, naval, and black ops units from up to a possible fourteen different nations. The game uses a special “universal strike” mechanism to resolve all types of combat, with an emphasis placed on missile defense if a player has any hopes of survival. Also included are rules for “cyber warfare and various political developments,” all of which factor into which countries become entangled in the conflict. The game ships with a 22” x 34” map covering the region with a scale of 70 nautical miles per hex. In terms of unit scale, ground units are modeled as regiments, naval units in small groups of ships and subs or individual carriers, whereas air units represent 30-90 aircraft. The game is designed for two or more players but can be played solitaire. This future warfare has all but eliminated fog of war as electronic transmission and the like make enemy positions known doing away with hidden units beyond motionless subs. This fact enhances the solo experience, as does the ability to play black ops chits randomly. To check out the game or pre-order a copy today head over to Compass Games’ website. You have a jungle. In said jungle is the ancient treasure of a long lost civilization. You aren’t the only one who knows about this treasure, so as expected there is a race to find it. However, remember this is a jungle and as such is fraught with much peril. Sounds fun … or incredibly dangerous, right? 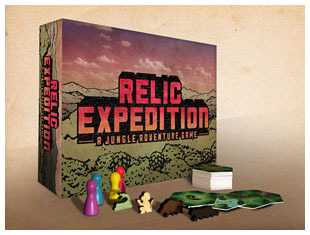 For those of us who would never go on such an adventure in real life there is Relic Expedition, the boardgame that allows us to do all this and more from the comfort of our own homes. One of the big draws for me with this game is its variable board. When the game starts only a few tiles are revealed. This is the starting point or base camp for the player’s pawns. As players move around the board, more hexes are revealed expanding the board and the adventure. Not only does this give the game a good dose of the unknown, it also ensures that each play through of the game will be different. As you explore the jungle you search for relics. Collect four of the same relic and escape the jungle to win. However, it is not as easy as it sounds. Each player has a “backpack” that only has eight spots for the relics as well as vital supplies and items needed to survive in the harsh jungle climate. These items include machetes, traps, rafts, first aid kits etc. When you start your expedition, you can fill your pack with plenty of helpful supplies but as the game goes on you must make the tough choices of which items to discard so you can carry more relics. Oh and did I mention that while doing all this exploring you will run into wild dangerous animals? I didn’t? Well you will, so watch your back. If this sounds like a game for you check out the project’s page to see its components and a game play video. 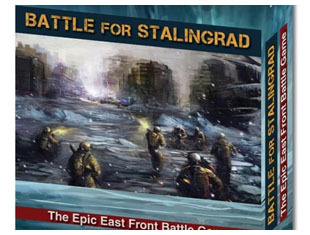 The Battle for Stalingrad has been fought and refought by military history aficionados and wargamers alike across a plethora of mediums. Now from prominent game designer Dan Verssen comes the battle for that frozen Russian city, fought using an “intuitive card based wargame.” This two player game pits a German against a Russian commander to see if history can be rewritten. The goal of this particular Stalingrad game is to control five locations throughout the city. These objectives are randomly selected at the beginning of the game from nine possible locations. Hopefully this will add some replayability to the game. Each of the locations has a control and perimeter area. If you have forces in the control area and the enemy does not, you have control of the location, for as long as you can hold it, that is. Each commander must manage a hand of cards, spend ration counters, and fight for locations. Ration counters play an important role in the game and are gained by controlling locations. They are used to move, fight, and absorb damage. Combat is central to the game and is resolved using the “firefight value” located on each card. Each commander plays cards from their hands to build their attack or weaken the enemy. Once both players pass, they each draw a random card and then tally results and deal damage. In addition to all of this the Russian player is trying to collect the three Operation Uranus cards that are in play. If all three are collected and in play at the end of the German player’s turn then the Red Army wins immediately. 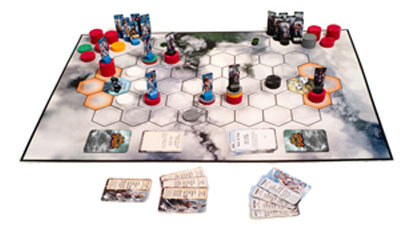 The game box includes 168 full color cards, rubble and rations counters, as well as a full color rule box. (The rules are currently available in PDF form to give you a look at the game.) All of these components appear to be up to the usual DVG quality. To see some of the game cards as well as a game play video check out the projects page. “The boardgame where gods battle in the skies.” No seriously…that’s what this game is all about. The players take on the roles of the ancient Norse and Greek deities and demigods and battle it out in an ethereal realm using a tactical card and boardgame. Sallying forth from Asgard or Mount Olympus as either a pantheon of 12 Norse or 12 Greek deities and destroy the opposing pantheon or their home base to win the game. The game promises to be playable in an hour or less and claims to have been made with the fewest rules possible. The games project page claims that it is like“Magic: The Gathering meets chess.” That sets the bar quite high, does it not? The game uses an interesting and unique chip stacking system to help keep track of each god’s stats. Red chips represent health, grey chips represent armor, orange chips are power, and green are disabled. All of these different chips stack under the deities’ playing piece, giving the player a quick look at the health and power of their character. However, should one of your gods die, the power-up stacks stay put waiting to be picked up by another. Each god has a corresponding card listing their relevant game data. Many times different gods’ powers can be combined for impressive attack combos in combat. These cards are drawn each turn showing you which gods are available to use and give the game some variability. Lest you think the gods alone are powerful enough, the deck of cards also includes items and perks that further enhance their powers. All of these things combine to form what looks to be an interesting take on the ancient gods in combat amongst themselves. Looking over the project’s page you can see images of the game’s components as well as an interesting gameplay video. $2,490 pledged of $50,000 goal, funding ends Thursday, May 2 at 12:31pm. I am not good at difficult games. Any difficulty setting higher than ‘normal’ kicks me in the groin and laughs. For reference just see my shameful posts on never winning a Shogun 2 campaign. Flowstorm, by Swedish Neat Corporation, claims to be one of the more difficult games ever created, so if I do fund this I will also fund a codpiece for myself. 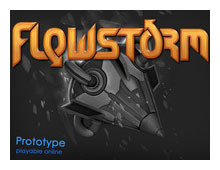 Flowstorm is a single-player and multiplayer platform flight racing game with puzzle and combat elements. Say what? The developers have crammed a lot of styles into Flowstorm and are of the old school, so hand-holding here will be at a minimum. If you like racing, space combat, puzzle-shooters or space-based fiction, Flowstorm has something for you. And if you like grueling difficulty with little in the way of hints, tricks or cheats…put your seatbelt on. Beyond the combination of genres and soul-crushing difficulty, a campaign is also being created and will feature Flowstorm’s own universe with accompanying lore and history. A level editor is also planned to be included with the final release, so the game looks to be moddable from the get-go. Flowstorm has already appeared on Steam Greenlight and has been widely lauded in reviews across the web, so the future for this platform spacecraft shooter puzzler campaign game thing is looking bright! Have you ever played Strange Adventures or Weird Worlds? Me neither. 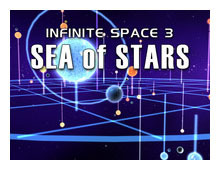 But Digital Eel produced those two space-based roguelike games, and Sea of Stars is their three-dimensional follow-up of space exploration and conquest. The developers are directly influenced by The Hitchhiker’s Guide to the Galaxy by Douglas Adams, and even the Kickstarter page is funny in spots. They promise to imbue Sea of Stars with the same type of hilarity, so if you take your space games very seriously, well…you have been warned. Sea of Stars is a single-player game that includes turn-based map movement with a real-time combat system set in a giant, dangerous universe where death lurks. Change and variety also lurk, and Digital Eel promise that no two games of Sea of Stars will ever be the same because of the dynamic game engine. Characters, space items, races and events will always be changed, every time a new game is started, and modding is encouraged and supported through an available set of mod tools. The game also acts and reacts to the style of the player, with in-game locations and NPCs not only acting as trade nodes but also going through their own events and drama within the game universe. The Kickstarter fundraising has been set up to speed up the completion of Sea of Stars’ art assets, as the core programming and design of the game are already done. Fundraising is within 2/3 of goal with about three weeks to go so things are looking good, with a beta coming down the pike for release in December 2013. Guns of Icarus Online is one of the few completed games now being sold to the masses that originated on Kickstarter. Think about that for a minute, I’ll wait. …kind of depressing eh? There are a lot of projects that come and go on Kickstarter and sadly, a lot of them don’t reach their goals and disappear. Muse Games has delivered on their marketing promises and Guns of Icarus Online is a digital monument to steampunk, with colossal Victorian airships, captained by opposing human opponents, shelling each other out of the skies. And the original single-player Guns of Icarus wasn’t too bad either. So what can Muse come up with next? I’m glad you asked. 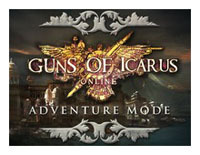 Guns of Icarus Online – Adventure Mode is a fully developed campaign with a lot of ambition. The world itself will be persistent and ongoing, with dynamics and change occurring while players are offline. Adventure Mode will also offer players the chance to captain and crew their own airships, as well as explore towns and sign up for missions in support or against one of six new in-game factions. Economics and politics will also be prominent in the game world and player action will be reflected in how the world evolves. Players in Adventure Mode can also ignore the drama in the world around them and fly for themselves as mercenaries. Basically, the original release of Guns of Icarus Online was the skirmish mode for the game…Adventure Mode is the campaign and will flesh everything out in an original world. And from the art samples and maps available on the Kickstarter site, Muse Games has some great ideas in steampunk aircraft design, costumes and uniforms, original music, and pseudo-Victorian architecture for their newly created factions and believable, eerie game world. The team is putting a lot of energy into this release and is trying to pull out all the stops. The only bit really missing from all this is a single-player option for old doddering gamers like me who don’t buy into the MMO voodoo thing. But for this new iteration of Guns of Icarus Online I may have to rethink my position on MMO voodoo. And that’s that, GARPA #16 has come and gone, with all the usual ups and downs. If your sensitive constitution can handle it, join us next time!